High court of Allahabad Recruitment notification for 2341 post of Junior Assistants job. Eligible applicants may submit their application form through online before 30 September 2014. Age limit: 18 to 40 years as on 01/07/2014. Qualification: applicants should pass the 10+2 exam. Selection Process: written test, skill test and interview. How to apply: Apply online 2341 post of Allahabad High Court Recruitment junior Assistants posts. Allahabad High Court Recruitment 2014 of 357 vacancies, 287 post of Assistant reviews officer (ARO) and 70 post of Routine Clerk Grade download the notification at www.allahabadhighcourt.in. 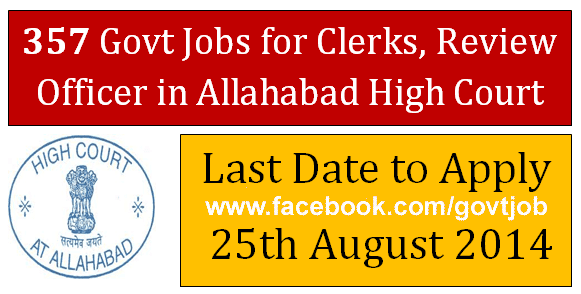 Allahabad High Court has given employment notification for assistant officers or clerk post for August 2014. Interested aspirants may apply online start from the 1 August to 26 August 2014. Know more about the jobs in Allahabad High Court i.e. age limit, salary pay scale, application fees, selection process, written test exam, admit card/call letter, how to apply online are given in the advertisement. How to apply: Eligible aspirants apply online at Allahabad High Court website’s www.allahabadhighcourt.in. Read employment notification carefully before applying online for Assistant reviews, Clerk post in Allahabad Court.